Sewell Barker, Corp. Co. G. 7th Vt. Vols. Joseph W. Fletcher, Corp. Co. H. 10th Vt. Vols. Azro B. Stiles, Corp. Co. K. 4th Vt. Vols. Rensselaer H. Tarbell, Corp. Co. E. 16th Vt. Vols. Francis G. Fassett, Corp. Co. C. 7th & Co. E. 16th Vt. Vols. William Piper, Sergt. Co. D. 9th Vt. Vols. Ransom T. Thompson, Sergt. Co. D. 9th Vt. Vols. Elmer L. Adams, Co. G. 7th Vt. Vols. Lewis A. Bryant, Co. C. 4th Vt. Vols. Warren H. Chapman, Co. E. 6th Vt. Vols. James Corliss, Co. E. 6th Vt. Vols. Amos G. Cook, Co. G. 7th Vt. Vols. Frederick E. Duncan, Co. G. 7th Vt. Vols. Alfred S. Earle, Co. G. 7th Vt. Vols. Albert B. Gibson, Co. G. 7th Vt. Vols. Willard Gilson, Co. E. 6th Vt. Vols. Geo. F. Hazelton, Co. E. 6th Vt. Vols. Albert Jefts, Co. E. 6th Vt. Vols. Charles A. Marshall, Co. G. 7th Vt. Vols. John L. Marshall, Co. K. 4th Vt. Vols. Fletcher W. Miller, Co. G. 7th Vt. Vols. Annis G. Noyse, Co. C. 6th Vt. Vols. Ausustus B. Strong, Co. B. 4th Vt. Vols. Benj. N. Ware, Co. E. 6th Vt. Vols. Wilbur F. Ware, Co. E. 6th Vt. Vols. James D. Witherill, Co. K. 4th Vt. Vols. John Bajoin, Co. E. 6th Vt. Vols. Eugene A. Thompson, Co. D. 9th Vt. Vols. Bradley L. Wheeler, Co. F. 17th Vt. Vols. Davis Williams, Co. F. 17th Vt. Vols. Rodney L. Benson, Co. D. 9th Vt. Vols. Dorman Barton, Co. K. 4th Vt. Vols. William L. Tyrell, Co. E. 16th Vt. Vols. Henry C. Hoadley, Co. G. 7th Vt. Vols. Horace C. Atwood, Co. C. 1st Vt. Cav. William F. Barnes, Co. F. 1st Vt. Cav. David E. Howard, Co. F. 1st Vt. Cav. Michael Lynch, Co. E. 1st Vt. Cav. Cassius M. Stickney, Co. F. 1st Vt. Cav. Geo. E. Watkins, Co. G. 1st Vt. Cav. John I. Willey, Co. C. 1st Vt. Cav. Geo. Eddy, Co. E. 1st Massachusetts Heavy Art. Walter S. Tarbell, Co. F. 1st U.S.S.S. Oscar W. Baldwin, Sergt. Co. A. 16th N.H. Vols. Ethan A. Bailey, Co. F.
Edward A. Marsh, Co. C.
Webster W. Ward, Co. F.
James H. Woodburn, Co. F.
John M. Buckley, Co. E.
Norman A. Morris, Co. F.
Geo. W. Field, Co. F.
John W. Curtis, Co. F.
Daniel J. Johnson, Co. A.
Henry R. Gibson, Sergt. Co. C.
William A. Miller, Co. A.
Ezra M. De Camp, Co. K.
John P. Field, Co. C.
Martin W. French, Co. K.
James B. Herron, Sergt. Co. C.
Xenophen E. Lockwood, Co. C.
Geo. C. Maxfield, Co. K.
Dexter S. Roberts, Co. C.
Albert A. Carter, Co. K.
Elliot W. Smith, Co. K.
Perry S. Bridges, Co. C.
James Drury, Lieut. Co. D.
Lucius C. Fletcher, Corp. Co. K.
William O. Gibson, Co. K.
William W. Hulett, Co. K.
Gerald D. Marsdale, Co. K.
Levi O. Pierce, Co. K.
Ambrose A. Stiles, Sergt. Co. K.
Geo. D. Marsh, Co. F.
Ambrose O. Bryant, Co. E.
Harvey O. Clark, Co. E.
Augustus A. Deming Co. F.
Albert S. Earle, Co. E.
Geo. W. Harris, Co. E.
Creon A. Smith, Co. E.
Dana R. Ward, Co. E.
Martin B. Chapman, Co. E.
Stephen F. Cook, Co. E.
Norman L. Cowing, Co. E.
Wyman S. Walker, Co. E.
John L. Bemis, Co. D.
Ara M. Carlisle, Co. D.
Justinian C. Clynn, Co. D.
Azro D. Barish, Co. I.
Charles W. Bridges, Co. D.
Otis F. Fletcher, Co. D.
Alonzo H. Rice, Co. D.
Adoniram J. Chandler, Co. D.
Nathaniel O. Abbott, Co. G.
Horace J. Clynn, Sergt. Co. G.
William O. Wilbur, Co. G.
Charles H. Hewett, Co. C.
Albert E. Reed, Co. C.
John S. Adams, Co. G.
Abner W. Field, Co. G.
Edward C. Adams, Co. C.
William W. Marsh, Co. G.
Sidney E. Weston, Co. C.
Ransom W. Rand, Sergt. Co. G.
Silas J. Smith, Co. I.
Ezra S. Dean, Corp. Co. H.
Albertus J. Archer, Co. E.
Joel B. Clark, Co. E.
William H.H. Cram, Co. E.
Theodore A. Edwards, Co. H.
Andrew J. Farrar, Co. H.
James A. 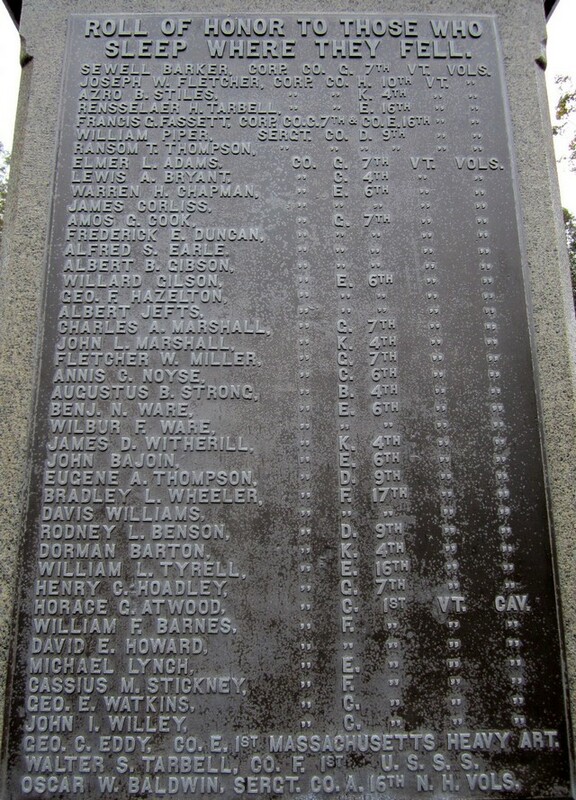 Gold, Co. E.
Almeron M. Gowing, Co. K.
T. Warren Heald, Co. E.
Albert S. Holbrook, Co. K.
Henry W. Knight, Co. E.
John J. Miner, Co. K.
Joseph S. Olney, Co. E.
Joseph Piper, 2nd Co. K.
Edwin S. Reed, Co. E.
James O. Smith, Sergt. Co. E.
Foster E. Taylor, Co. E.
Wesley L. Ware, Co. E.
Irving B. Baldwin, Co. E.
Artemus A. Blood, Co. E.
Palamedus F. Cook, Co. E.
Elmer H. Dudley, Co. K.
Fred. J. Fitch, Hosp. Steward. William O. Gould, Co. E.
Hiram F. Hall, Co. E.
Hugh Henry, 2nd Lt. Co. I.
Daniel P. Kingsbury, Co. K.
Gideon E. Lee, Co. K.
Henry A. Muzzey, Co. K.
Geo. W. Payne, Co. K.
Arvin E. Pond, Co. K.
Charles J. Tarbell, Co. E.
Alvin L. Thompson, Co. E.
Warren C. Williams, 1st Lt. Co. H.
Lyman G. Wood, Sergt. Co. K.
John P. Bliss, Co. F.
John H. Lord, Co. F.
Edward C. Whitney, Co. F.
James W. Johnson, Co�s C. & K.
Preston S. Knapp, Co. F.
William Powers, Corp. Co. B.
Edwin H. Stoughton, Brigadier-Gen. Vt Vols. Charles L. Davis, Capt. Co. D. 10th Minn.
Josiah Jefts, Co. B. 10th Minn. Vols. Lorenzo Atwood, Co. G. 7th & Co. F. 11th Vt. Vols. John C. Balch, Co. E. 176th N.Y. Vols. James E. Bolles, Co. F. 1st U.S.S.S. Edwin M. Carlisle, Co. E. 1st & Co. E. 6th Vt. Vols. Thomas R. Clark, Drum Major, 1st & Capt. Co. E. 6th Vt. Vols. Ptolemy O. Edson, Asst. Surg. 1st Vt. Cav. & Surg. 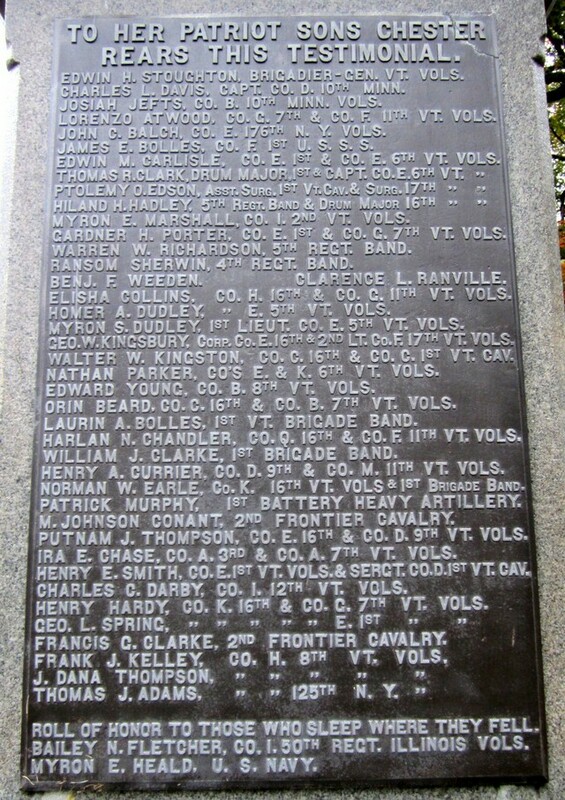 17th Vt. Vols. Hiland H. Hadley, 5th Regt. Band & Drum Major 16th Vt. Vols. Myron E. Marshall, Co. I. 2nd Vt. Vols. Gardner H. Porter, Co. E. 1st & Co. G. 7th Vt. Vols. Warren W. Richardson, 5th Regt. Band. Ransom Sherwin, 4th Regt. Band. Elisha Collins, Co. H. 16th & Co. G. 11th Vt. Vols. Myron S. Dudley, 1st Lieut. 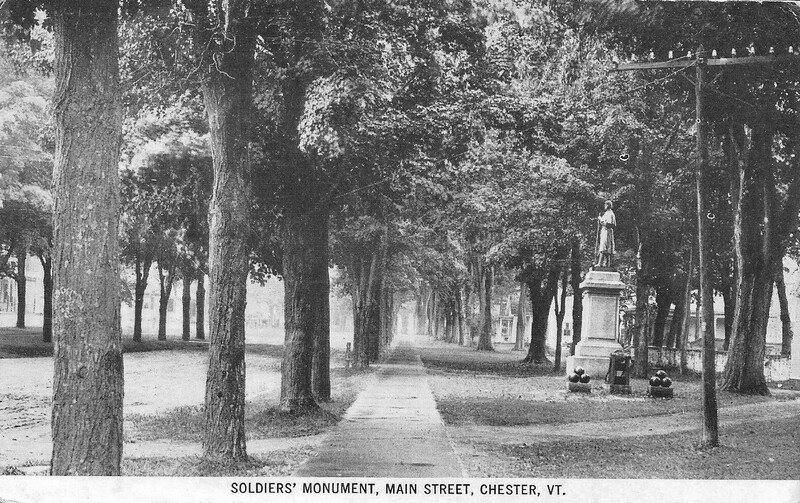 Co. E. 5th Vt. Vols. Geo. W. Kingsbury, Corp. Co. E. 16th & 2nd Lt. Co. F. 17th Vt. Vols. Walter W. Kingston, Co. C. 16th & Co. C. 1st Vt. Cav. Nathan Parker, Co�s E. & K. 6th Vt. Vols. Edward Young, Co. B. 8th Vt. Vols. Orin Beard, Co. C. 16th & Co. B. 7th Vt. Vols. Laurin A. Bolles, 1st Vt. Brigade Band. Harlan N. Chandler, Co. Q. 16th & Co. F. 11th Vt. Vols. William J. Clarke, 1st Brigade Band. Henry A. Currier, Co. D. 9th & Co. M. 11th Vt. Vols. Norman W. Earle, Co. K. 16th Vt. Vols. & 1st Brigade Band. Patrick Murphy, 1st Battery Heavy Artillery. M. Johnson Conant, 2nd Frontier Cavalry. Putnam J. Thompson, Co. E. 16th & Co. D. 9th Vt. Vols. Ira E. Chase, Co. A. 3rd & Co. A. 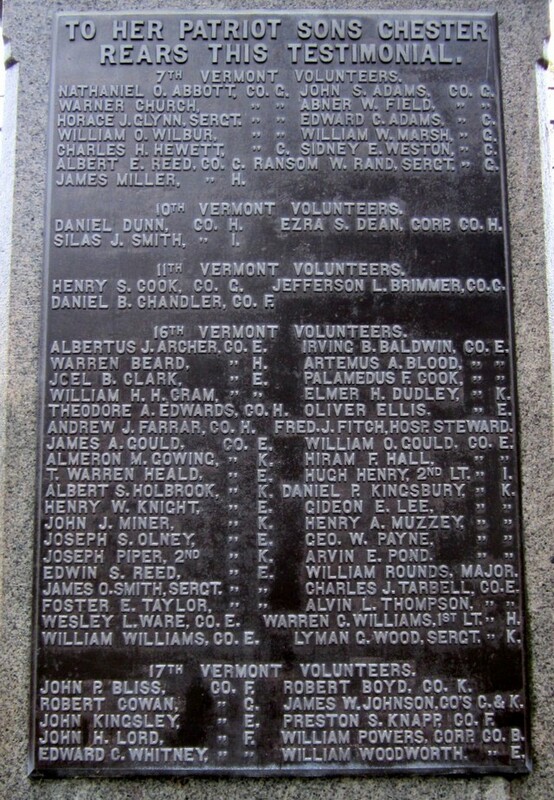 7th Vt. Vols. Henry E. Smith, Co. E. 1st Vt. Vols. & Sergt. 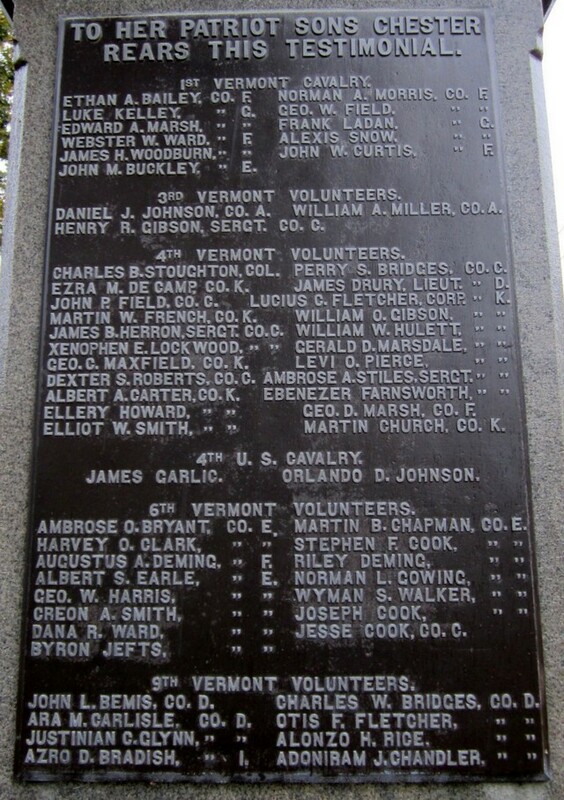 Co. D. 1st Vt. Cav. Charles C. Darby, Co. I. 12th Vt. Vols. Henry Hardy, Co. K. 16th & Co. G. 17th Vt. Vols. Geo. L. Spring, Co. K. 16th & Co. G. 17th Vt. Vols. Francis G. Clarke, 2nd Frontier Cavalry. Frank J. Kelly, Co. H. 8th Vt. Vols. J. Dana Thompson, Co. H. 8th Vt. Vols. Thomas J. Adams, Co. H. 125th N.Y. Vols. Roll of Honor to Those Who Sleep Where They Fell. Bailey N. Fletcher, Co. I. 5oth Regt. Illinois Vols.